What has the highs and lows of Six Flags’ Superman roller coaster with the bumps and rattles of Coney Island’s Cyclone? The answer: A career transition. 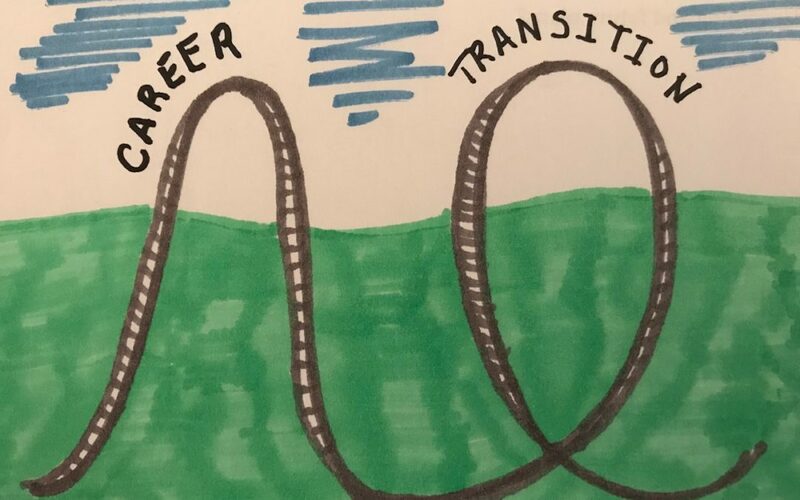 A career transition evokes the exact same emotions as an amusement park roller coaster – at least for me. First, I’m excited. My stomach is filled with butterflies. I’m certain that good things are ahead. Then as I watch people swirl and swish overhead on the piped track of Six Flag’s Batman my head gets into the game, but I also start questioning my decision. Then, once I am clipped into the seat and steadily approaching the top of Canobie Lake’s Yankee Cannonball, listening to the click-click-click of the cog, my excitement starts to change to trepidation only to be quickly followed by a stomach jarring plunge and shaking that jitters me from my skull to my toenails. But then I find excitement rising again as my prep starts to bear fruit – like I’m climbing up the steep incline of Superman towards a multi-story view of the surrounding terrain. This is, of course, immediately followed by that stomach lurching drop as I wait for responses. And just like the smooth twist and swish as Disney’s Rockin’ Roller Coaster glides to a stop, the transition eventually ends with a feeling of accomplishment and relief. It’s over but there were plenty of ego bruising shakes, shocks, and screams along the way. Making a career change usually starts out exciting. But when you move from thinking about the fresh start to taking physical steps to facilitate that change, the experience can rapidly move from an exciting one to a plunging feeling of self-doubt…What exactly do I need to DO to land that job? You are going to have to embark on the ride and take some bumps to get to the right result. Here are 4 simple and actionable steps to smooth some of the highs and lows– but trust us – you will still have a lot of ups and downs. And we promise to add to this list over 2019. Build that network, but do it with diplomacy. When you reach out, always send a message introducing yourself and explaining your interest in connecting. The ONLY time I skip this step is when I send an invitation while I’m talking to the recipient in real-time. Trust me, most of us have been burned by accepting an invite from a stranger with shady motivations. So politely explain your interest in your outreach. This means you must put some thought into why you are making that connection. Then write a short but meaningful intro – it will increase your connection yield and your memorability. Make it easy for hiring managers and recruiters to know what you bring to them. If you do this, you are half way over the hurdle. For example, if someone asks you, “Why do you want to work here?”, it’s easy to tell them that it is a good next step for you. Well, ok, but how does that make you attractive to that company? However, if you answer in a way that explains how you are going to help them, you’re going to make an impression. Research thoroughly and spend time thinking about their perspective. Hint: Informational Interviews are key. It’s never too early to start practicing for your job interviews. It takes time to process feedback, try different techniques and move up the learning curve. Think about how you want to answer questions and practice your answers out loud! When Candorful gets a request for practice interviews a few days before a candidate’s real interview, my heart always sinks just a bit. It minimizes the impact we’re going to be able to make. When you’re in the last stage of prepping for an interview, your mind is already booked solid and there isn’t much room to work on your interview skills. However, if you practice 2 months/ 6 months/ 1 year in advance you have time to think through your feedback and reformat your answers. Give yourself time to learn and improve…even before you have scheduled your first interview. 4) Fear comes in many forms. Train as you fight. Job interviews are notoriously stressful, and in our busy lives we must prioritize. So, it’s easy to justify walking into an interview cold, without practice. After all, you can hold up your end of a conversation just fine, right? Well, once you’re in the hot seat and they ask you a question that hits close to your Achilles Heel, it’s too late to step back and formulate a creative and thoughtful response. So, just like you do when you’re preparing for a military deployment, presentation, marathon/5k, or your karaoke debut, train as you fight. I’ll make this simple – Practice, practice, practice, and then practice some more. If you’re going to stick your neck out to change careers, then why not prep for the “gate” (otherwise known as the job interview) that controls whether you are able to make that career change? So, Practice. And Candorful wants to help. Pat Hubbell is cofounder of Candorful, a nonprofit working with veterans, military spouses and transitioning military to support their job interview prep. Find more about Candorful’s good work at www.candorful.com.